These Silverthorne condos will have frontage along the Blue River with the master bedrooms and living rooms looking directly at the Blue River. They will also have 2 surface parking spaces and outside storage for winter and summer gear. While the Rainbow Run duplexes will have attached 2-car garages. Finishes include wood floors in the dining and living rooms, stainless steel appliances, granite countertops, rock gas fireplaces, walk-in closets , in-floor radiant heat and more. 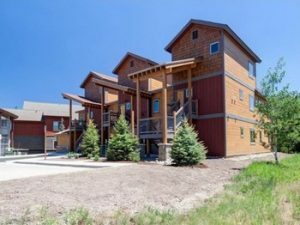 If you are looking for a condo or duplex on the banks of the Blue River in Silverthorne, Colorado real estate look no further than the newly built Rainbow Run complex. For more information on Rainbow Run such as a full list of features, floorplans or to arrange a showing of these Silverthorne properties or other homes for sale in Silverthorne Colorado, contact Justin & Krystal Knott at LIV Sotheby’s International Realty in Breckenridge, CO at 970.333.9050 or email them directly at knott@sothebysrealty.com.